This 16 part series of OVAs follows on directly from the TV series. The episodes in this series are truly odd (but still extremely enjoyable). The first four resolve the Griffin saga from the TV series. Most of the remaining 12 are quite frankly oddball comedies. The themes of the stories range from toothaches, lost kittens, amnesia, love motels, albino alligators who lay giant pearls and even a parody of the last episode of Ultraman. One of the oddest ones was written by Yutaka Izubuchi. "Snow Rondo", one of the few stories here which isn't a comedy, is quite an odd tale about Asuma meeting an old school friend whom he once had a crush on. It's definitely Twilight Zone material. The last episode, "All Quite at the SV2", goes out on a perfect note. An excellent way to end such a superb series. This series was originally released in Japan with the TV series on laserdisc and VHS in a "Perfect Edition" and "Standard Edition". The "Perfect Edition" laserdisc and VHS release of the TV series would have three TV episodes and one new OVA (the original release volumes were labelled "P1" to "P16"), while an alternate VHS release mostly for the rental market called the "Standard Edition" only contained the one OVA per tape. In western fandom during the 1990's, the OVA series was sometimes referred to as the "P-Series" because of the labelling on the laserdisc releases. Also in it's original release, the first seven episodes were confusingly released in a different order (episodes 5 to 7 alternated with the four Griffin episodes). When the series was released in an LD box set in December 1995 in Japan (and for subsequent re-releases in Japan, as well as all English language releases), the order of episodes were changed so that the four part Griffin arc was at the beginning of the series. To avoid confusion, I have written the episode synopses in this new order as shown below. In the US, this series was released before the TV series. Since many of the episodes in this series follow on directly from episodes in the TV series, parts of it must of been confusing to new viewers. Maiden Japan released the series in the US on Blu-ray and DVD. Madman Entertainment in Australia released the series on DVD. MVM Entertainment in the UK released the series on DVD. All versions of the discs in each country include an English dub (first four episodes only), original Japanese dialogue and English subtitles, but no extras. The Maiden Japan DVDs and Blu-rays are only available in the US, and therefore will only work on DVD/Blu-ray players that are both NTSC compatible and will play region 1 DVD discs and region A Blu-ray discs. The Madman Entertainment DVDs are only available in Australia and New Zealand, and therefore will only work on DVD players that are PAL compatible and will play region 4 DVD discs. The MVM Entertainment DVDs are only available in the UK, and therefore will only work on DVD players that are PAL compatible and will play region 2 DVD discs . If you don't live in these countries, check your player's instruction manual to see if it will play the discs. Please see the English Language New OVA Releases Video List for a complete listing of all releases, formats and product specifications of this series in English. Patlabor the New Files (UK) PAL DVD, Region 2. Japanese Dialogue and English Dub (English Dub for episodes 1 to 4 only) with English Subtitles. This series is available in a single DVD box release and a single Blu-ray box set release in Japan from Bandai Visual. The DVD and Blu-ray sets do not come with English subtitles or an English dub. The DVD and Blu-ray sets are only available in Japan, and therefore will only work on DVD players that are both NTSC compatible and will play region 2 DVD discs and region A Blu-ray discs (if you don't live in Japan, check your DVD's instruction manual to see if it will play the discs). Please see the Japanese New OVA Series Releases Video List for a complete listing of all releases, formats and product specifications for this series. A GWEI Product. ©2003 - 2018 GWEI. 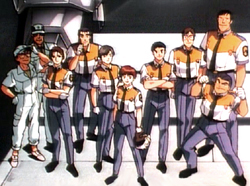 Patlabor New OVA Series ©1990 - 1992 Headgear/Emotion/NTV/TFC. All other logos/trademarks are copyright of their respective owners/companies. Used for review and illustration purposes only.